The triune God demonstrated love for us in the most costly transaction imaginable; in response we ought to eternally thank him and sacrificially obey all that he commands. As you might imagine there are times that I am asked as a pastor, “What is your favorite book in the Bible?” And I sincerely answer when I get that question, but it’s always seemingly the book that I’m in the middle of expositing to you all on the weekends, because I can’t help but be so entrenched and focused in that particular book that it just impresses me with its wisdom and the particularities of how it explains and presents the truth. And certainly the Gospel of Luke that we’ve been in has been an impressive section of God’s inspired library and I can’t help but say, I’d like to say for months, but now for years, “Hey, this is my favorite book of the Bible right now that we’re in, the Gospel of Luke.” And as you might imagine it’s not just they ask me what’s my favorite book. Sometimes people in personal settings getting to know me they say. “Well, what’s your favorite passage of Scripture?” And I guess you’d suppose that whatever week I might get that question it would be that week that I’m so involved in that short text that I’m going to teach to the church that weekend that I would say, “Well this text is clearly my favorite.” And I imagine many times that’s the case. But the passage that we’ve reached in our verse by verse exposition of Luke, we’ve come to a section of Scripture that’s hard for me to say, “Well yeah, this is my favorite.” Is it important? Centrally important. It’s just very uncomfortable. As a matter of fact, the passage that we are reaching that starting a 12-part exposition of the rest of Chapter 22 and all of Chapter 23 is one of the most agonizing sections of Scripture for us to really stop and ponder, to put ourselves in the sandals of the folks who are there in the first century watching this historical narrative play out. It’s just a very, very difficult section of Scripture. It’s not a section you’d say, “Well this is my favorite. I’m really enjoying this,” because really it’s the most humiliating death that you could possibly imagine. As a matter of fact, the artists, as I often say in the Renaissance period, couldn’t even depict it the way it actually was. An absolutely naked man being treated as a criminal, hanging in full exposure after being beaten and his face pummeled and, as the prophets said in the Old Testament, an unrecognizable marred face with blood streaming down his body. Absolutely naked on a cross dying. Well that’s the section we’re getting to in Luke and I can’t tell you, “Well, this a great section, this my favorite section.” But if you were to really consult the Bible, I mean if we’re going to personify the Bible and say, “Hey, Bible what is your favorite section of the Bible?” The Bible would say this section. At least it would say it’s the principle central section. As a matter of fact, everything in the Old Testament is leading toward this particular historical scene. All of the sacrificial systems, they all symbolically head toward this one historical point in biblical history. Everything in the New Testament flows from this section of the Gospels. The things that we’re called to do in terms of the Lord’s Supper in remembering something historical that relates to our salvation zeros in right here on this scene that begins today in our study of Luke. The entry way to the agony of Christ, the Passion of the Christ it is sometimes called, in the old sense of that word and that is the suffering of Christ. It’s important to Scripture, it is central in Scripture. Although I must warn you we are going to enter into something that’s not about gratuitous scenes of torture that we’re going to try to exploit to the place of making us all feel grossed out. “Oh, look, this is so awful.” I mean, we have to take it for what it is but it’s worse than that. It’s an innocent person. Someone we learn is giving himself as really the central expression of the first verse you ever memorized. John 3:16, “For God so loved the world…” that explains the verse everyone learns first, “For God so loved the world that he gave his only Son.” He gave him, what does mean? Gave him how? To come chill out and hang out with us for 33 years? No. He came to send him to this agony that were about to step into. That’s a remarkable statement. And yet it is, in a world that loves to pander to the lowest common denominator of the definition of love, this kind of sentimental, green, fuzzy feeling in our gut, the Bible says, no, here is the best demonstration of love. As Jesus had no greater love as anyone than this, that a person would lay down their lives for a friend. And Romans 5:8 says this is the ultimate demonstration, “God demonstrates his love for us in this, that while we we’re yet sinners, Christ died for us.” And he dies not by decapitation, he doesn’t die by being hung, he doesn’t die by being thrust through with a sword, he dies by being hung on a torture rack and slowly dying, before the eyes of our imagination in the text that we’re about to get into. So in that sense, I just got to warn you, we’re getting into a very sober part of Scripture and yet it is the central part of Scripture. And even those looking from the outside in have known this, “Oh, you Christian…,” particularly in earlier generations than ours, we’ve glossed ours over, made it very plastic, but certainly in the old days they’d say, “Those Christians are all about that death of Christ, you know. They’re focused on the death of Christ and it’s odd, they seem to celebrate and rejoice in the fact ‘Christ died for us.’ What does that even mean? Christ died for us.” Well that’s what we’re getting into here and we get the answers in the symbolism that’s used in the text of Scripture that comes from the words of Christ himself. Let me read for you the first entry into the crucifixion section of the Gospel of Luke, beginning in verse 39 of Luke 22. Luke Chapter 22 verse 39. We’re going to study this morning from verses 39 through 46, as we see Jesus in a familiar scene, if you know the narrative of Christ’s death, it is preceded by a time in a garden, a garden where he’s praying. A garden where he’s praying in agony. And you might picture the apostles as really tired and kind of conked out because they’re so tired, this text reminds us they’re not conked out because they’re tired. They’re conked out, they fall asleep when they’re supposed to be praying, because they’re in sorrow. This whole thing is just painful, gloomy, dark, agonizing. Let me read it to you, not to try and bring you down this morning, but try to let you know why the church would sing songs and celebrate and do something called worship and praise God for the death of Christ, as it begins to unfold in our study of Luke beginning in verse 39. Let me read for you through verse 46 in the English Standard Version. It says, “And he,” that is Christ of course, “came out and went, as was his custom, to the Mount of Olives, and the disciples followed him.” Remember, this is Thursday. They’ve had the Upper Room, which is not far, at least traditionally, it’s been honored, even from the first century and certainly under Hadrian’s rule, you’ve seen Christians acknowledging this place, which is south by the Mount of Zion, if you know the hills of Jerusalem. If you’ve been there to modern Israel, they still have a place where they recognize the Last Supper, and it may in fact be the place. It probably takes you about 15 minutes to walk from Mount Zion along the edge of the Temple Mount, Mount Mariah, down across the Kidron Valley and up into the upper ascending slopes of the Mount of Olives. Because olives were very important, obviously, in the ancient world. It was a staple of the ancient world. It was not only used as a very important dietary function for Israel, it was used as a commodity, it was used as fuel for their lamps to keep the city lit at night. It was used medicinally as medicine. It was the number one medicinal suave for the people and, of course, in ceremonial laws of the Old Testament, it was used ceremonially. Gethsemane, you might know that name, that was the name of this particular garden as the other Gospel writers tell us. “Geth” in Aramaic, it means press, “semane” olives. It’s the olive press. It’s where they would take a big stone and they would press out the olives to get the oil out of it. And this was full of olive trees. Olive trees, if you go to Israel today, you go to Gethsemane, take a tour, someone tours you through there, or if you go this next summer, Pastor Pete, Pastor PJ will tell you these olive trees have been known to live over 2,000 years, believe it or not. The ones in Gethsemane are estimated to be about 900 years old. Big, fat kind of ugly twisted trees, the staple of the ancient world. And in this garden, that’s named after olives, he’s in an olive garden. A kind of out of the way, off the road, up from the Kidron Valley place, a great place for them to pray. A great place for the disciples to meet in a quiet setting. He is now there and his disciples are there. They’ve had the Last Supper and Christ now proceeds to pray. And he’s going to tell his disciples to pray, verse 40, “And when he came to the place,” which we know in the other Gospels is called Gethsemane, the oil press, “he said to them, ‘Pray that you may not enter into temptation. '” Now that’s an interesting thing, we need to unravel that, he repeats that at the end of our passage, “you need to not be tempted. I don’t want you to be vulnerable for temptation. Temptation is always the prelude to sin. I don’t want you to sin.” There are some particular temptations here that they are tempted to sin in and it’s already been forecast with the forecast of Peter’s denial, and he wants them to pray, get strong, get ready, brace yourselves. Cups are filled with some kind of liquid. The liquid is to drink, the drinking of something in a cup, a very common image throughout the Bible. It’s an analogy and a picture of something and in this case apparently a bad thing whatever is a cup must be bad to drink. You don’t want to drink it. It’s painful to drink. Your thoughts of drinking it are going to lead you, as it says here soon, to agony. But he says in verse 42, I want you to remove this cup from me but, “Nevertheless, not my will…” Don’t over Christianize that word, that means “want.” It’s not what I want, not the thing that I prefer, “but yours,” implies your wants, your desires, what you prefer, “let that be done.” I’m resolved to that. And so when it’s time to pray so they can be strong, they’re sleeping because of their pain, their sorrow, their agony, and he said to them, “Why are you sleeping?” We know this happened more than once, multiple times, in this garden scene. Luke only records the summary that it happened, that he says, “Why are you sleeping? Rise and pray that you may not enter into temptation,” and leaves us with that. Before then in verse 47, as we’ll see next time, a crowd shows up with Judas to betray him. “Cup.” Circle that word, highlighted in your devices. Verse 42, underline it in your Bible, “Remove this cup from me.” Maybe you were here a couple of Good Fridays ago when I tried to illustrate on Good Friday that the death of Christ was Christ in the Garden considering drinking a cup. I’d like you to turn to an Old Testament book. We didn’t have the opportunity to do that on Good Friday, but let me do that now. Turn with me to Jeremiah Chapter 25. If you’re having a hard time with that in your old Gutenberg Bible, go to the Psalms, turn right five books and you’ll find the major prophet Jeremiah. Jeremiah is the weeping prophet. A lot of sorrow here. Certainly not another passage… and then again another example of a passage that most people aren’t going to say, “Here’s my favorite passage.” This is a weeping prophet about the most incendiary part of the pain in his own life. And it has to do with the cup and here’s the imagery. But let me give you some background. So drop down to verse 8. We’ll get to the cup imagery, which is really what’s in view in Christ’s mind and we see this. We’ll lay out the whole equation of this. Verse 8, “Therefore thus says the Lord of hosts: Because you have not obeyed my words, behold I will send for all the tribes of the north,” I’m going to call the northern tribes up there, “declares the Lord,” and beyond those up and over into the Chaldean, you know, the Mesopotamian area, this up and coming king named Nebuchadnezzar, he’s powerful, he’s ruthless, he’s the Hitler-of-the day. OK? “I’m going to call for him, Nebuchadnezzar of Babylon, my enemy.” No, no, no, wait. What does it say? “My servant.” I’m going to use this evil dictator. “And I will bring them against this land,” the land of Judah, “and its inhabitants, and all the surrounding nations. I will devote them to destruction, and I’m going to make them a horror.” They’re going to be like the black and white pictures that we see from the Holocaust and we look at them in horror. That’s what I’m going to do here to my place, my land, Mount Zion. Mount Mariah, the temple in all of its glory that Solomon had built. I’m going to make it a horror and people are going to see it in the ancient near eastern culture of “hissing” they’re going to hiss at it and they’re going to go, oh this is awful, “and an everlasting destruction. Moreover, I will banish…” You think about all the good things that are going on here now as people were bustling about in their sin and rebellion against God and their idolatry, “I’m going to banish from them the voice of mirth.” There’s a word you haven’t used this week, probably, mirth, happiness, joy, parties, “and the voice of gladness,” you’re not going to hear any of that anymore. The voice of probably the most celebratory thing we do, a wedding reception, “The voice of bridegroom and the voice of bride,” you’re gonna hear that anymore and “the grinding of the millstones,” and kind of that smell when you pass In-N-Out Burger, you know like “Oh, lunch, we should stop and get something.” The idea of preparing food. You’re not going to hear that, “and the light of the lamp,” those flickering lamps in the windows of these ancient buildings of Israel up in the Old Testament times even, multi-levels, you could come up to the city wall and see this glistening twinkling of the lamps. You’re not going to see any of that anymore. Not my favorite text. Probably not your favorite text. But nothing more than expansion of a verse you learned as a kid. Here’s the other verse you learned as a kid: “The wages of sin is death.” It’s a shame that verses like John 3:16 can roll off of our tongue, and we can say that without a lot of visceral reaction to what it means that God gave his only Son. And it’s something that we can sit and kind of yawn our way through the “wages of sin is death” and not realize what’s being said. The wages of sin… “wages” that’s an accounting term. Right? The wages of sin. We have an accounting term here, the “recompense.” There’s a debt because of your sin and your transgressions and it needs to be paid. And the Bible says the payment is a cup and the cup is bitter and it’s a bitter cup symbolizing the judgment that you deserve. Earlier in the night when Jesus was with his disciples he took a cup and he called it the cup of the covenant in his blood. Matthew records it as the cup of the covenant in his blood which is for the forgiveness of sins. It’s a cup. It’s a cup that Paul later says in First Corinthians 10 is a “cup of blessing” where God has blessed us because of what’s in that cup. And we’re to drink it. It’s the cup of blessing with which we bless, that word “bless”, just a compound word of the little particle “eu”, which means “good”, and the word “logia”, which means to “speak”. It’s something that we speak really well of. We are so grateful for what that cup represents. You don’t deserve heaven. Do you know that? I don’t deserve heaven. Every non-Christian has this sliding scale about what they think they deserve, because they’re so engrossed in lateral comparisons. The Bible says, you and I need to come to grips with the fact that when we look at the scene of Christ going to the Garden and agonizing about going to the cross, and then going to the cross, this is all about payment, a recompense, drinking the cup that you and I deserve. And I’d like to personalize it this morning to summarize what I’m saying here in your first point. Number one. You need to “Realize that His Pain,” which just the thought of it was agonizing for him, “Was Your Penalty.” Penalty. Penalty. Penalty. If you’re a non-Christian this morning, you don’t get this, I understand that. You don’t get it. The Gospel’s veiled to you. You don’t get this. I understand that you don’t get it. You don’t get it. “Penalty! I don’t deserve a penalty,” you say. But the Bible says you do. It’s just the hard facts. You know what the insurance company doesn’t care about? They are not a part of this “Everyone gets a participation trophy, affirming everyone to make them feel good. And if you think you’re great, do whatever you want, you can do anything.” That’s not the world the insurance agents live in. They live in the world that’s completely… they look at real hazards, real statistics, and the statistics, of course, are just the opposite of what most teenage drivers think about their driving. They say, “You are a radically high risk.” As a matter of fact, they say, “You’re three times more likely, as a teenage driver, to be in an accident than people who are older than you.” Three times more. So guess what they do? “You’re going to pay for that. We got to pad our insurance trust. We got to have a lot of money in the bank to pay because you’re going to get in an accident. You are more likely than other people to do that. You get distracted, you text, you drive, you drink, you drive. You guys are just a mess.” And they sit there and go, “No I’m not. I’m really good.” Matter of fact, male drivers… the number one premium… you got to pay more for a male young teenage driver than any other demographic of driver out there. Even the slow drivers you get behind over here, and you think, “Oh, those people are terrible drivers.” They’re not the worst. They’re bad. But they’re not the worst. And by the way, it’s the male drivers who think they’re the best drivers as teenage drivers. The evangelists have two opportunities. They can go to people, like I can go to you this morning, I can somehow look at the death of Christ as some kind of, I don’t know, expression of love, as an example of martyrdom. I can somehow spin it, it would be hard for me, I’d have to be creative, but there are a lot of guys doing it really well today, effectively. It’s terrible, it’s heinous, it’s heresy, but they’re good at trying to make you feel that the death of Christ had nothing to do with you deserving penalty. There’s an old phrase in theology and it’s very important. It starts with the word penal substitutionary atonement. Penal means that it’s a payment, and a penalty that needed to be paid. That Christ died as a penal substitute so that he drank the cup of God’s wrath and anger so that you wouldn’t have to. And don’t stop me at the door like the lady did, I tell this story often, and I said something about God’s anger and she stopped me at the door and said, “God doesn’t get angry, my God doesn’t get angry,” and I like when they make it really personal and say, “My God doesn’t get angry,” and I said, “Well then your God is not the real God because the real God gets angry.” She replies, “Well, no, maybe in the Old Testament.” But as I often say, he took a nap in the inter-testament period, woke up feeling so much better in the New Testament, the God of love in the New Testament. That kind of Marcionism, if you know heresy, that’s just wrong, it’s sinful. Stanley and others today trying to posit that, unhitch the New Testament from the Old Testament, don’t get me started with all that, but they’re all about the idea that God is not like that. I love to quote Revelation Chapter 14, not because it’s one of my favorite passages, but because all that imagery of drinking the cup of the dregs of God’s anger in the Old Testament… Let me read it. Here it comes. You think that’s relevant, not just for now, in the future? Speaking of what’s happening on the last generation of people with iPhones in their pockets, the iPhone 34, whatever we’re at that point. He says, “I will make them drink the wine of God’s wrath, poured full strength into the cup of his anger, and they will be tormented with fire and sulphur in the presence of the holy angels.” Now, that’s a New Testament passage. God’s got time to kind of get over his anger towards sin. We’ve got a lot of time. This is the 66th book of the Lord God’s breathed library and he’s still angry. Angry at what? Angry at sin. And guess what? Sinners get punished for their sin. They get recompense for their sin. That is unless God would somehow devise a way in his sovereign plan to relieve people of that penalty by sending a perfect substitute. Atonement means that that sin that was there is wiped away. Penal, penalty, substitutionary, he suffers for you. You know the verse from our Partners Manual don’t you? First Peter Chapter 3 verse 18. “Christ suffered for sins, the righteous for the unrighteous.” “Christ suffered for sins once for all…, the righteous,” he was the righteous one, the perfect one, for, “hyper” in Greek. That’s a strong word. It’s a simple sentence, you can read it, but you need to read there, “in a penal substitutionary covering of your sin.” “The righteous for the unrighteous, that he might bring us to God.” First Peter 3:18. Unless God can devise a way, because he cares for sinners, to say, “I want sinners not to have to suffer the consequence of their own sin.” “Realize His Pain Was Your Penalty.” It was your penalty. Your penalty. You need to see Christ in his agony agonizing over whether or not to pay for your sins. That’s what was going on in this text. And, of course, you know what happens. He does. He becomes a sacrifice. And God treats him as though he had done everything sinful that you have done. I’d like you to think about that as unpleasant, we’re already in an unpleasant passage, in an unpleasant sermon. Right? Compass 2020 – let’s grow the church. Now let’s preach a horrible sermon like this about how awful we all are. Let’s see how that works out. “Operation Crowd Reduction.” Right? Here we go. I want you to think about your sin. Think about the things that, if I put it on the screen right here and I had video of you saying those things, doing those things, I had the brain-a-scope on your forehead thinking those things. The things you try to hide and put under the carpet so no one sees, here it is. Think of that. And I want you to think that the Father was willing to put his Son in the crosshairs of all of his anger about those things on that screen. And he said, “I am willing to punish him so that you don’t have to be punished.” His pain and he’s grieving, he’s agonizing over doing this, and he’s saying, “If there’s a way for me to get out of the drinking this cup, I do not want to be treated like those people in that church in Orange County who are hearing that sermon. I don’t want to be I want to be treated like I’m them.” And yet that’s exactly the penalty. We read it, not long ago in our Daily Bible Reading, Second Corinthians 5. “God made him who knew no sin,” the righteous, “to be sin.” He was the target of all of God’s righteous indignation towards sin, the recompense, the payment. “God made him who knew no sin to be sin, so that in him,” in Christ, “we might become the righteousness of God.” His pain in this scene for the next twelve weeks that we will look at, was your penalty. Substitutionary atonement. It’s falling out of favor today. A lot of guys, particularly here in Southern California, lots of them in Orange County in pulpits, they’re talking about Christ’s death in a completely different way than the New Testament talks about his death. Because all that stuff that predicates the message of the substitutionary atonement of Christ, they’ve gotten rid of, and that is that God’s is not mad at us. “And there appeared to him an angel from heaven, strengthening him. And being in agony he prayed more earnestly; and his sweat became like great drops of blood falling to the ground.” He was willing to do this. And not only that, verse 43, when God sent an angel from heaven, he didn’t send an angel to deliver him from the mess. As Christ actually said on the cross, “I could call ten thousand angels to deliver me from this, but I’m not stopping this,” and the Father’s not only not stopping this, he’s sending angels to strengthen him. Hang in there, we’re going to the cross. You’re going to drink the cup. You’re going to pay for their sins. You’re going to get the penalty that they deserve. I think the most natural reaction to that, if anyone understands the problem, is thanksgiving. You can’t be saved without it. J.C. Ryle this 115 years ago, whatever it was, when he preached that sermon and he said, “You know the foundation of anything, really in Christianity, saving Christianity, is you understanding sin.” If you don’t understand that — hopelessly lost. The first thing to be attacked in modern Christianity is the concept that you and I are sinners and undeserving of God’s love. That’s love that demands our life, our soul and our all. It’s amazing love. It’s a love that most people in the Twitter universe, when they talk about God’s love, they have no idea what it is that the Bible presents as God’s love. “For God so loved the world that he gave his only Son.” He gave his Son to be agonized in a garden so that he could go to a cross and be executed completely naked and beaten, having to march through the towns with no clothes and a cross over his shoulder as people spit on him and Roman soldiers beat him. That’s how much God loved the world. That doesn’t even make sense to someone who doesn’t understands sin. It’s a costly love. Couple of problems we have, I think, when we think of forgiveness, because it’s all about forgiveness. Right? Yeah. Why is it love? Because I get to be forgiven. I get to be forgiven. You can sit here today, you can sing the songs, we’re about to take the Lord’s Supper and you can say, “It is so great that his blood, his body, broken on the cross 2,000 years ago, that is my forgiveness. Oh I’m so glad.” But you don’t think about what those symbols represent. And I’ll tell you why. Because we quote passages like this: First John Chapter 1 verse 9. Right? “If we confess our sins, he is faithful and just to forgive our sins and to cleanse us from all unrighteousness.” And you know what we think about? He’s a God who says if you confess – I’ll forgive, confess – forgive, confess – forgive. And we think that’s his job, he’s just a nice, loving God. He’s got my picture on his fridge and he loves me so much and all I’ve got to say is, “Oh dad, I’m sorry.” And he forgives me. In Leviticus the picture of sacrifice is laid out. I said all the Old Testament sacrificial system pointed to this scene that we’re starting for the next 12 weeks to unfold in the Gospel of Luke. And it started in Chapter 1 verse 4 with the worshipper coming with a lamb as a guilt offering, a burnt offering, a burnt offering that it was all burned up. None of it was given even for food for the Levites. It was the picture of your sin, guilty before God. You were to come with that animal, put your hand on the head of that animal, stand before the priest and the priest was then to see that this spotless blemishless lamb that you brought was representing you. And then you were to take the knife and slit the throat of this animal. And it’s a gross, awful scene, blood pouring out of the neck as it collapses to the ground, blood spilling on your sandals, on your big toes and then you’re to take that blood and you were to throw it on the side of the altar and that animal was to be hoisted up on the giant barbecue in the middle of the patio of the worship center and burn it, burn it to a crisp. Now it smells really good. I guess that’s the only positive thing there. And the Bible says that, it smells good. But it’s a picture of an innocent animal dying so that you don’t have to. That’s the focus of the Old Testament sacrificial system and it was repeated over and over and over again so you could see here is a payment for sin. We now should have no need for that because all we have to do is look back in our mind’s eye to the history of Christ’s crucifixion. And therefore, when we say, “confess your sins and he’ll forgive you,” we should see very clearly right in between that. As a matter of fact, it is represented with that word “dikaios” or righteous or just. “If we confess our sins, he is faithful,” he’s going to do what he says, “and he’s just.” He’s just. What does that mean? He’s going to do the right thing about right and wrong. And the right thing about right and wrong is not forgiving sinners. No, it’s about holding them responsible. But he forgives us. Why? Because our mind should rush back to the payment. Let me read for you from Leviticus Chapter 5. You can identify with the first part of this and the last part of it, which is, confess and forgive. And I love the way it’s put in verse 5 of Leviticus 5, “When a man realizes his guilt in any of these things,” he just talked about, “and he confesses the sins he’s committed.” I like it so far. I know the next verse, verse 6, must be “and the Lord forgives him.” No, that’s not what’s next. Oh, that’s coming. Verse 10 says, “and he will be forgiven.” Even the bottom of verse 6, “The priest is going to make atonement for his sins.” He’ll be forgiven. By the time this story is over he is forgiven. But listen to verse 6. “A man realizes his guilt,” I’m guilty, he sees his sin, something our culture struggles with, and then “we confess it,” we agree, “God we’re sinners.” Then that man, here it comes, “shall bring to the Lord as his compensation,” I love that translation from the English Standard Version, bring his payment, his compensation for his sins, “the sin that he’s committed.” Bring that lamb as an offering for sin and then “The priest will make an atonement for his sin.” And then, three verses later, you’ll be forgiven. If he confesses his sin, he’ll forgive you. You’re missing a few words there that represent the pyramid, a huge iceberg of theological truth. If you confess your sins he is faithful and righteous, or just. And that justice came to bear on a cross. When the Father could say, “A debt needs to be paid, but I paid it in my own Son.” And then he’ll forgive you. If you understand that then you understand the costly nature of his love because you and I forgive out of fiat. Right? Like, “Hey, I’m sorry.” You say, “OK.” That’s how you were taught to forgive. Someone wrongs you, you go, “OK, I guess it’s fine. No problem, we’re square.” Well you’re not square. Someone wrongs you. And we’ve wrong God with grenades through the windows and torches and rocks and we’ve assaulted the holy God of the universe and there’s got to be a payment for that. God, now, inside his CIA compound in Benghazi, if you will, takes his only Son and crucifies him so that he can forgive the rebels who are assaulting his holy compound. You and I need to thank God for his costly love and that’s something that is critically important because of the depth and the cost of this. The Father didn’t send an angel to deliver him, he sent an angel to strengthen him. In his sweat, by the way let me just take a little sidebar here on what some people call the bloody sweat passage. I don’t believe this is, as some people have said, blood coming from his capillaries and his pores. I don’t think that’s what’s happening here. Matter of fact, read the passage again. “His sweat became like great drops of blood.” Now if you cut your brow or your forehead, you had a cut on your face and it was really bleeding, it would be dripping, dripping, dripping. There’s a kind of sweat that comes, not because you’re hot and perspiring because your body’s trying to cool itself down. The eccrine glands in your pores will secrete water and salt and potassium, a liquid that comes out of your pores and it’s there so that the evaporation process, God in his design of our bodies, so it would cool it down to get it back to the right temperature so we can continue to function. Sweat. It’s important. There’s another kind of sweat. Sometimes deodorant commercials will talk about it. It’s called stress sweat. And it’s not the eccrine glands that secrete it. It’s the apocrine glands that secrete it and they are connected usually to the hair in your body, in your armpits, in your scalp. And that produces a different kind of secretion that’s not just water and salt and potassium. It has proteins in it and fatty acids in it and it’s much thicker and it comes out, not because your body’s hot, it comes out because your body is sweating because you’re stressed out. We got to be thankful for that kind of love. I can assure you that no one loves you as much as Christ does. Other people make your tummy flutter, other people get the green fuzzy’s about, other people have done some really nice things and you’ve gone, “Aww”. You’ve done all that.” But you’ve had no one love you like this. And you ought to be profoundly thankful. If you’re thankful when someone brings you flowers, if you’re thankful when someone pays for your lunch. Well, that’s nothing, compared to someone that was agonizing, who’s about to be treated like he was the one who did all the evil, sinful things that you and I have done. But there’s more. And it’s almost like, man, can’t you lighten up on your apostles? Verses 45 and 46, “He rose from prayer, he came to his disciples, found them sleeping for sorrow and he said, ‘Why are you sleeping? '” Well, you just answered the question, at least Luke did, because they’re all stressed out too and they fell asleep because they’re sorrowful. The disciples had vowed their loyalty to Christ. Peter, the most vocal of them. And while he had bigger loyalties in his mouth than he did in his heart, Christ certainly wanted him to express his love. He says to him in John 21 after his failure, he comes back in that post resurrection appearance and says, “Do you love me? Do you love me? Do you love me? If you love me then feed my sheep, tend my lambs, do what I told you to do.” And here he says, “I told you guys to pray.” Look back up at it, verse 40. “Pray that you may not enter into temptation.” They say, “No, I’m too tearful. I blotted my tears. I’m just going to take a little nappy nap.” Jesus is saying, “Nope, get up and pray. Because there’s something much worse that’s going to happen if you don’t obey me in this, you’re going to disobey me in a much bigger way down the road. Obey me.” You should not only be thankful for what Christ did for you. You ought to love him back. How? By doing what he says. Number three if you’re taking notes. “Love Him by Doing What He Says.” That is what the Bible teaches from beginning to end. Jesus said it, did he not? John 14:15. “If you love me you will keep my commandments.” He said this in Luke 6:46. “Why would you call me ‘Lord, Lord’ and not do what I say?” Don’t tell me you love me, don’t tell me I’m the king of your life, don’t tell me that I am your lord. Don’t say any of that unless you’re willing to express that through what you do. I would like you to think about doing what God says and it wouldn’t be bad, as we were about to pass the elements for the Lord’s Supper this morning, that you would think about the big things in life, perhaps the things that you have fallen in and say, “God, I’m so grateful that you remove from us our sin as far as the east is from the west.” That’s great. Celebrate that. And then I hope you come out of that saying, as so often is the case in Scripture, I am now resolve to go the other way. It’s called repentance. I’m going to say no to this, what I’ve done. I’m going to regret it. I’m going to feel the guilt. I’m going to recognize Christ’s death on a cross paid for it and I’m going to resolve to walk in favor with God by my behavior and my words and my actions. But here’s the other thing. It’s all those little things that Christ is now commanding, that sometimes you dismiss because you’ve got all these excuses and no one is going to go, “Ohhh! You didn’t come to church all that much this year.” No one’s going to say that. They’re going to do that when you completely destroy your life with those big sins, but it’s the little sins most people go, “I understand if you’re not serving.” You know you’re called to serve as a steward of the manifold grace of God in our church. If you’re not serving you’re in sin. Sorry. Small sin. At least that’s how people see it. I mean, it’s not like you cheating on your wife this week, but it’s sin. We’ve talked about this 2020 campaign, we said it has nothing to do mandatory giving, but we underlie that with the fact that all of us are called to give financially. If you’re not giving you’re in sin. Oh, it’s a small sin in the sense that no one’s going to say, “Ohhh!” Because you’re going to say, “Well I’m in a tough place financially, I can’t give.” That’s sin. Reading the Bible. We have our Daily Bible Reading, we have all these things we tried to do to encourage your Bible reading. You may not have the time. “How is your time in the Word this week?” “Well, I didn’t get very many days,” and no one’s going to go “Ohhh!” But it’s sin. You are called to be a person that has the word of Christ ritually dwelling in you. You can’t do that unless you get it in your life. You’re called to handle the Word of God accurately. You’re called to be all these things as it relates to the Word of God. Like good Bereans. Prayer. “How’s your prayer life?” “Well, I’ve been really busy this week.” Sin. All I’m saying is, as you have these elements passed to you, I want you to think, “OK God, I’m grateful for the costly love that this represents, but I also want to say that my response is not only thanksgiving,” which is what the word eucharist means, which was early in the church, something they discussed, that the cup was a cup, not only of blessing, which is a similar sounding word, but it’s the “eucharisteo”. It’s the thing we give thanks for. It’s the cup that we rejoice in God and we bless and we give thanks to God for it, that’s true. But it’s also something that should remind me to respond with loving him. And James says, “Don’t tell me you love God, don’t tell me have faith in God, if you don’t have the deeds to back it up.” Do we fail? Absolutely. If you say you’re without sin, you’re lying. We all stumble in many ways, James said. We do. But the change in your life ought to be evident. And really the quality of your love isn’t really going to come down to what kind of lifestyle is coming out of your repentant conversion? I’m just asking you today, as we pass these elements, I’m going to ask the ushers to come down now, I just want you to think about, “What am I doing in regards to that? How am I living my life? And now, what about the little things that shore this up.” You should be spending more time in your church family than you have before. Why? Because the Bible says it, “All the more as you see the day drawing near, you ought to not forsake the assembly…” These are the kinds of commands that you and I have got to get serious about. Josiah Conder wrote this hymn in 1856, “Oh, the love beyond the reach of thought, That form’d the sovereign plan; Before Adam had our ruin wrought, Of saving fallen man! God has so loved our rebel race; As his own Son to give, that whoso will, amazing grace! May look to him and live.” Amazing love has been given to you. You spend time with God. In about 5 minutes I’ll come back up, I want to give you plenty of time to talk with the Lord. We’re going to take these elements together so hang onto them, and together, just as a sign of our unity in being in Christ, we’ll take these elements at the same time. But talk to God, spend time with him. Recognize that these elements represent something so profound, that was willingly accomplished for you and for me. Sometimes it’s really good to sit in a serene place like this to ponder the kinds of eternal truths that the busyness and noise of our life doesn’t allow us to do very often. I trust you’ll make time for that regularly. We ought to be regularly thankful that the center of our theology that God so loved the world that he gave his Son represents something so much more profound than most people would ever imagine as they hear those words come out of our mouths. Our world is in desperate need of clarity regarding precision and theology that represents what took place on the cross. I pray that this church becomes very active in thinking and talking in ways that the God of heaven would say, that’s exactly what that was about. It’s not about good feelings, it’s not about successful lives, it’s not about having healthy bodies. It is about that Christ died, the righteous for the unrighteous that he might bring us to God. Boy we need clarity about that in our minds. Celebration? Great. Yes, absolutely. As far as the east is from the west. It’s a great line. He’s removed our sins from us. But it doesn’t come just because we confess it and out of thin air he just forgives. Just like in Leviticus 5 there has to be a recompense, a payment. To feel that, to sense that is critically important because it makes us grateful Christians, the kind of grateful Christians who are willing to give their lives, their all, to follow Christ in a world that is hostile against them. And it’s ramping up in its hostilities against us. It’s hard enough among my colleagues, so to speak, in knowing that I am still believing in heaven and hell and the cross and sin. I mean, these are things that have fallen out of favor. Let alone the culture in which we all live in, that thinks this is all nonsense. Everyone on their deathbed has to deal with these issues and I want you to prepare. Matter of fact, when I have to be, and so often it happens, even this week, people dying in the last 24 hours. When I’m there at those scenes or dealing with those families, I often say that’s what this has been about the whole time. Everything in our theology been about that. Are you ready for that hour, that day? So I hope that what we do now in our hearts comes back in a rush of great peace on our deathbed. And that’s what I’ve been about my whole life, being ready to meet my maker. Because we are in Christ. And I trust that’s true of you and, if it is, let us with thanksgiving eat this bread and drink this cup. God, in obedience to Christ’s commands we have participated this morning in this modified Passover observance of eating this bread and drinking this cup and remembering your death. And you said until you come and God, here we are 2,000 years later still doing what you’ve asked us to do, may the experience not only be a check mark of obedience for us as a church and as people, but it may be the kind of thing that motivates us to thank you and love you more. God, let that be produced in us this week in a way it hasn’t in the past. Let us be more resolved to walk in step with your spirit and you empower us to live for you this week. Awesome sermon full of truth and guidance, delivered with a clear Biblically accurate and motivating voice and structure. Awesome sermon! 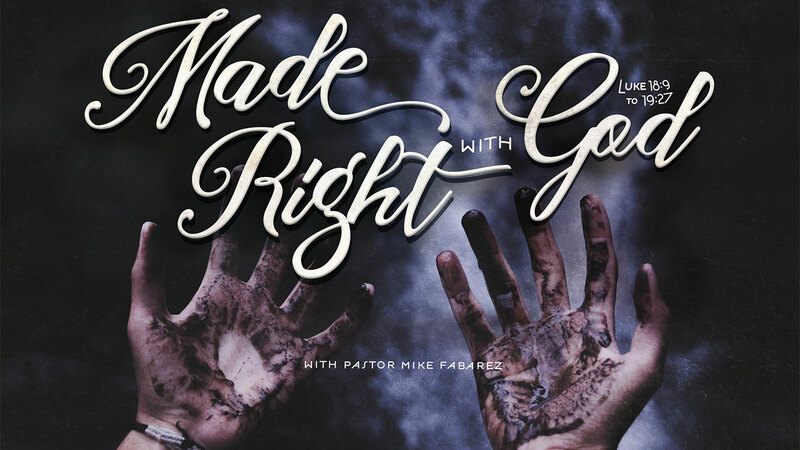 Pastor Mike delivers a clear, motivating, Biblically accurate message that: 1. Makes it easier to BE STRICT and diligent with your children/family and 2. Demonstrates the necessity to LOVE even though others are not acting in a way that would make them worthy of your love. This sermon develops a beautiful (and harsh) representation of the beating and sacrifice as well as the warning to the disciples prior to the crucifixion. An hour feels more like a minute as Christ’s own voice seems to come through Pastor Mike’s message.